Lieutenant Colonel Candace Dare glared at the reports on her desk. She remembered a long conversation with her superior, General Daniel Fitzhugh, that she was not being hired as a “paper pusher.” Yet, here she sat, pushing paper. She knew that it had to be done, but she thought that she would not be the one to do it. She was hired to be the field investigator for the Inspector General office of the Defense Advanced Research Projects Agency (DARPA). So, as always with the Army, the assigned field investigator sat in her office pushing paper. Not that those papers didn’t need to be examined. Little line entries might be hiding something extraordinary. If someone caught a little line entry six months ago, an ex-Nazi may not have gotten as far as he did. He was just about ready to build an army of USA dead zombie soldiers, when Fitzhugh and Dare finally caught up to him. But the paper trail should have set of alarms much, much earlier. Which is why the IG office of DARPA was created in the first place. She sighed, attached each line entry, looking for stolen rabbits, kidney removal tools or any odd thing that looked like something weird was going on. Any research funds that went to big parties, she just referred to the Government Accounting Office (GAO) for collection. That was one reason she thought that Fitzhugh should transfer one of the GAO people to DARPA IG. Fitzhugh understood, but the wheels of bureaucracy turned very, very slow. Warrant Officer Will Hutton joined her in the quest for pennies; General Fitzhugh was out on a site. The last DARPA mishap turned a little high school girl into a green-skinned super hero. The poor girl had to forgo her summer vacation and go for testing at the Army’s premier testing facility, Aberdeen Proving Grounds. She was going to be treated as if she were a new type of bomb, or some sort of tank. They would run her through her paces and engineers with clipboards would decide what to do with her. Dare knew she was really annoyed that Fitzhugh took her there. How would some old war horse know how a little high schooler should be treated? Certainly not the white coats and slide rule workers! Poor thing, she fumed for the thousandth time, it wasn’t really her fault, just some dumb mail room clerk. Dare was angry she wasn’t the one taking her there. They would have treated her right if I took her, not like some green side of beef! Back when World War Two started, many young kids lost there innocence and had to deal with awful things, she knew. But the war was over for just over seven years, things should be normal. No one should grow up like I did, Dare smoldered. A knock at the outer office door broke Dare’s reverie. She heard Hutton say his perfunctory; “Come” before the door opened. He heard voices and thought she heard her name. Two quick raps at the door confirmed her suspicions. “Come,” she said. The door opened and WO Hutton stood at attention. “Colonel, a Mr. Winslow Owens from Recalcitrant Laboratories would like a few moments of your time, ma’am,” Hutton announced. Dare smiled. They would play this game all day long, being regulation formal when visitors came to the office. They shuddered to think if the outside world really knew how they worked. Worse, if it ever was reported to the upper brass. “Give me a few moments to tidy up, Warrant Officer,” Dare said. She needed to secure the TOP SECRET materials in her office before she admitted a visitor. “Yes, ma’am,” Hutton answered, saluted and left. She heard him tell the visitor that the Colonel will be with him shortly. She hurriedly locked the sensitive files away in her sure cabinet. When the key was removed from the lock she pushed her intercom button which lit a red light by Hutton’s phone. Hutton nodded to Owens and knocked twice again on the door. Dare stood to receive her visitor. “Colonel Dare, this is Mr. Winslow Owens from Recalcitrant Laboratories,” Hutton said. He left immediately closing the door. Dare took in the man across the desk. Owens didn’t look like one of the scientist types; he was either a salesman or an accountant. “What can I do for you, Mr. Owens?” Dare asked. Dare thought a few minutes. She really had nothing defrosted. It was getting late and she didn’t feel like going to the grocery store. The two left Dare’s office. “Have a good weekend Will,” Dare said on the way out. They walked through the Pentagon, the car waited near the curb. The driver opened to doors and off they went. When the car pulled to the curb at the Four Seasons, the doorman opened Dare’s door. She waited for Owens. The restaurant seemed fairly busy for being a little early in the evening yet. Dare glanced at the crowd, wondering how many were Soviet spies, knowing she was being a little paranoid. At least she didn’t have to worry about Nazis anymore. The maitre d’ sat them near the center of the room. Dare felt like everyone was watching them, which was both creepy and reassuring. The dinner was quite boring. The food was great. Listening to Winslow Owens’ rise to rank of middle management of Recalcitrant Laboratories was less than exciting. She took notes on his contact information, of course. The stories of great corporate success she could have done without. When it looked like things were going to wrap up, a waiter stopped by the table with two glasses of champagne. Dare looked confused. “Oh, but he is mistaken,” Dare said. “Neither one of are driving right know, Colonel. We shouldn’t insult him,” Owens said. Dare faced the gentleman and raised her glass and drank. The gentleman responded by raising his glass and smiling. A scar shone on his left cheek. Dare put down the glass and stood. A wave of intense dizziness washed over her. “You Bast…” was all she could manage to say before she hit the floor. 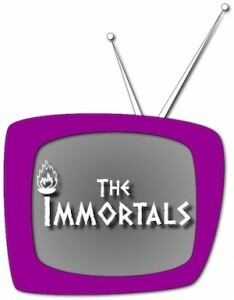 This entry was posted in The Immortals and tagged Candace Dace, The Green Girl. Bookmark the permalink.